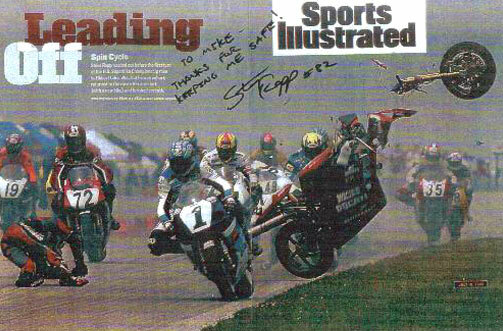 "a private showing for fans of the sport"
STEVE RAPP WAS NOT WEARING YOUR TYPCIAL BACK PROTECTOR! Vance & Hines Ducati Factory rider, STEVE RAPP, crashed spectacularly at over 100mph before a National Television Audience. Steve, whose crash made the JULY issue of Sports illustrated (see above), was wearing our latest Back & Chest Protection system at the time. During the crash, Steve was slammed violently to the pavement on his back and sent tumbling and sliding approximately 50 yards. Before coming to a stop, Steve hopped to his feet and ran back to the pits for his back up motorcycle. Steve not only finished a credible 7th by race end, but was able to compete THE NEXT DAY without suffering any ill effects of the crash! 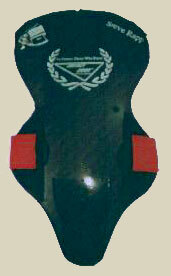 Steve's Back Protector of choice on that faithful day B-000! !